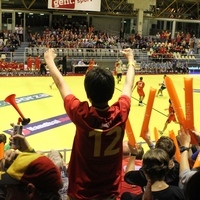 1,800 Belgium handball fans in Gent's HET Tolhuis went home with a big smile on their faces on Wednesday night as they witnessed the home team making a first small step towards the World Championship 2015 in Qatar by beating Israel 29:28 in Round 1 of the Qualification Europe. Kevin Jacobs became the man of this Group 4 match when he netted the decisive penalty that pushed Belgium in the lead at 29:28 just seconds before the final whistle. In Group 3 Slovenia, the team that had come fourth at the World Championship 2013 and that in June had only narrowly missed the qualification for the EHF EURO 2014, celebrated a hotly contested victory against a strong Swiss team. Despite trailing 13:18 at half-time, Switzerland never gave up and put Slovenia under huge pressure in the second half. But courtesy of a strong performance of their back court aces, Borut Mackovsek (seven goals) and Sebastian Skube (four goals), Slovenia scraped home the victory. "At the beginning we were intimidated by this world class squad," said Swiss coach Petr Hrachovec. "But then we proved that we are also able to play handball on top level." In Group 1 Finland beat Turkey 26:20 and Lithuania won 23:17 against Georgia. Mikael Mäkalä became Finland's top scorer with 10 goals, which currently sees him topping the qualification's top scorer ranking together with Ukraine's Olexandr Shevelev who also contributed ten goals to Ukraine's 38:34 win against Luxembourg in Group 3. In the only Group 2 match on Wednesday Slovakia beat Cyprus 35:14. Italy face Romania in this group on Thursday night. In Group 4 Netherlands followed Belgium suit and beat Greece 25:20. In Group 5 Latvia celebrated a 29:26 victory against Portugal. The second Group 5 match, Estonia vs. Bosnia and Herzegovina, takes place on Thursday night. For both matches on Thursday there is live ticker available via the EHF's website. Only the winners of the five qualification groups make it to the European play-offs in which they will play against one of 12 EHF EURO 2014 participants or Germany in a double-header to decide which European teams make it to the World Championship 2015 in Qatar. The play-offs will be played in June 2014.